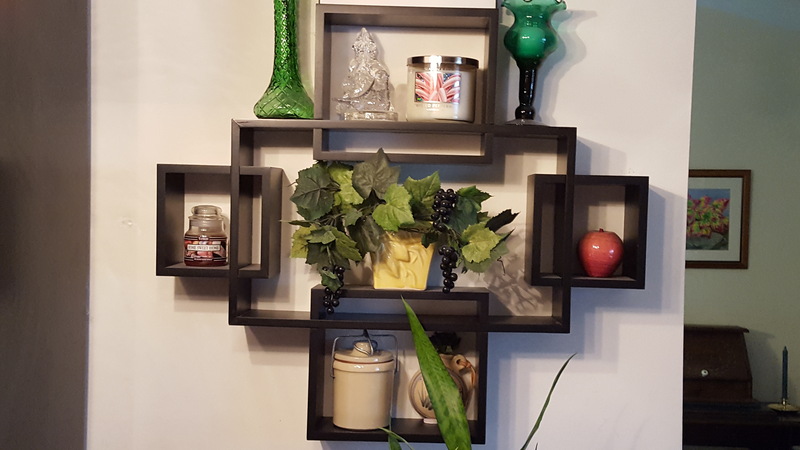 The above image was colored by my wife, who consulted with me on the best images to select for the book, and suggested their level of difficulty. Creating new fractals is about seeing the potential for art all around you, even in the most basic and mundane parts of our lives. 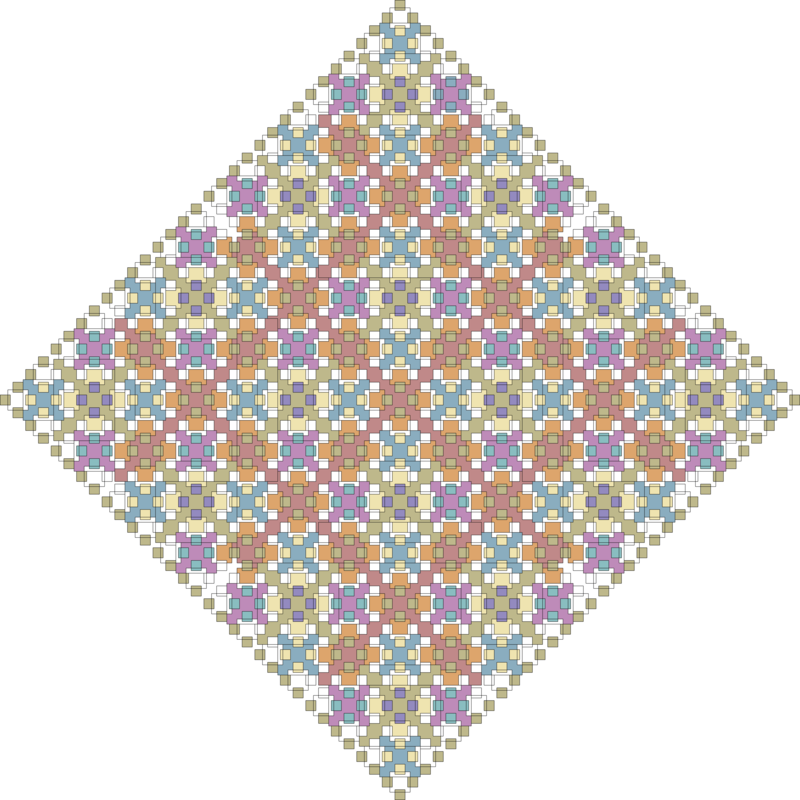 Simple patterns can be expanded into something intricate and beautiful. And deciding how to color these new patterns adds an even greater level of artistic expression. A simple object can be transformed into a universe of variations. That’s what I enjoy most about creating the coloring book, seeing how others take a pattern and make it their own. If you enjoyed this post and would like to learn more about fractals, check out my Adult Coloring Book: Fractals available on Amazon. I just got my first interlibrary loan yesterday (ILL for all you bibliotheque nerds). It is an interesting mix of adult responsibilities and genuine excitement. The book is due on April 30th (no renewals), and I will be fined $2.50 a day if it is not returned. There’s an envelope it must be returned inside, and a sleeve that is stuck to the outside cover. The cheapest I could have bought this book was $20, with most copies ranging more in the $50-$60 range. As I continue on the journey from a general interest in fractals to a more specialized exploration, there are only going to be more such books and loans (though I still have to fight off the hoarders mentality that I’d have if I had a University Library’s budget). It struck me the other day how different the way I conduct research now was from when I was in highschool and college. The internet was a strong resource in both times, but where I’d be printing off papers in college and compiling them in a notebook, now I am just throwing things on my tablet. I found a 2000 page math encyclopedia on the Internet Archive the other day, and I can carry it around in my bag without any back strain. Yet I still find myself working with paper when it comes to taking notes and working things out. Part of this is simply mobility, it’s easier to take notes on paper at idle moments than it is to use a computer. And part of it is that I believe as many do, that taking notes on paper is a better way to retain information and to organize thoughts. Plus it’s a way to make use of the dozens of notebooks that have piled up in my house that have yet to be filled with brilliant short stories. I’m a little more specialized with these notebooks than college. I got into a genuine discussion with Brian over whether Moleskine is pronounced “Moleskin” or “Moleskeen” (I prefer the later even though it is likely wrong). And I have all different sizes, larger stay at home notebooks for rough work, smaller reporter pads for technical notes, and mid-size for more general information. My “go bag” has a tablet, an eReader and six notebooks! 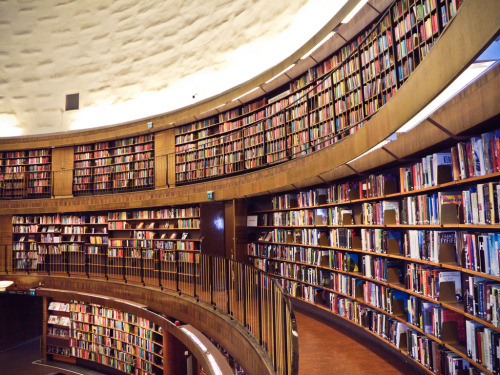 And even when I find myself frustrated with pay-walls for articles, or expensive books, I am amazed at how much knowledge is just out there for free. Even with the potential for steep fines, getting a book from an inter-library loan was cheaper and almost as quick (if not faster) than buying the book myself. I do admit to some impatience with having to wait for physical materials, both waiting for them to arrive, and waiting for time to read them at home. It’s why I’m a fan of writing affordable eBook reference materials. But sometimes there’s nothing like a good primary source from an author whose name you need a pronunciation guide for. How do you do research? 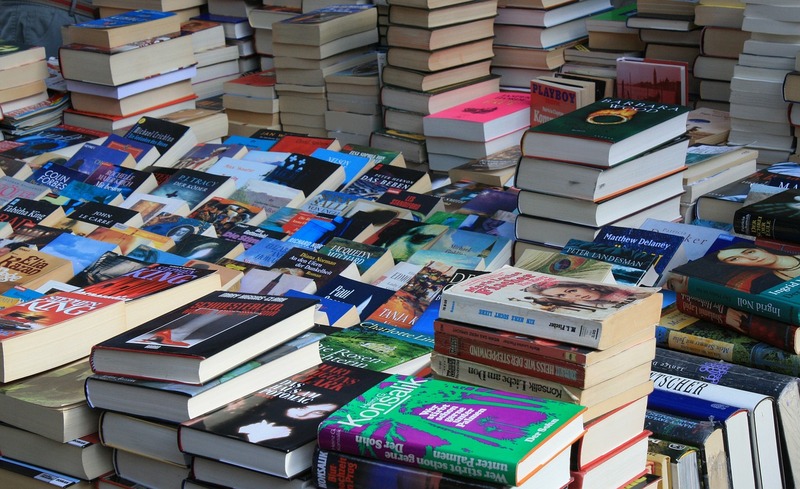 Are you still a pencil and physical book sort of person, or is Google the way to all knowledge? 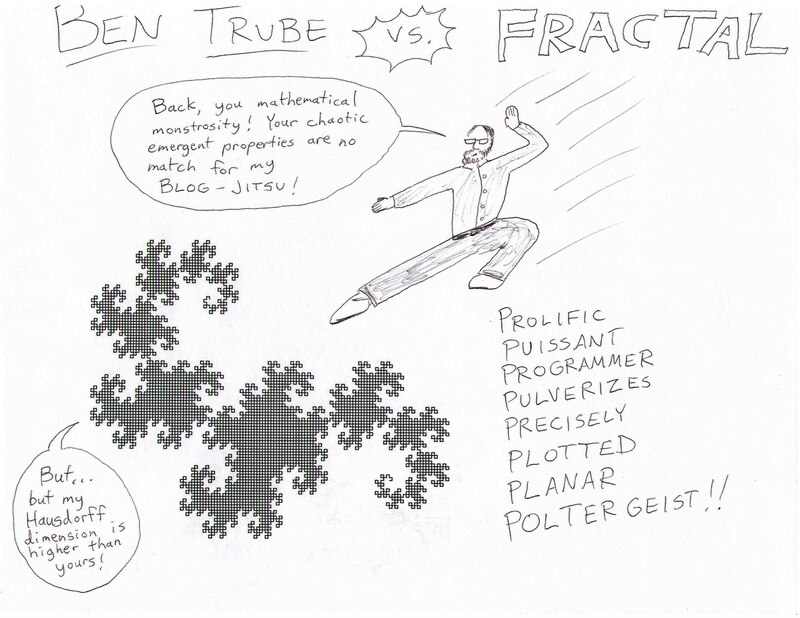 One of the results of previous research projects was Fractals: A Programmer’s Approach. 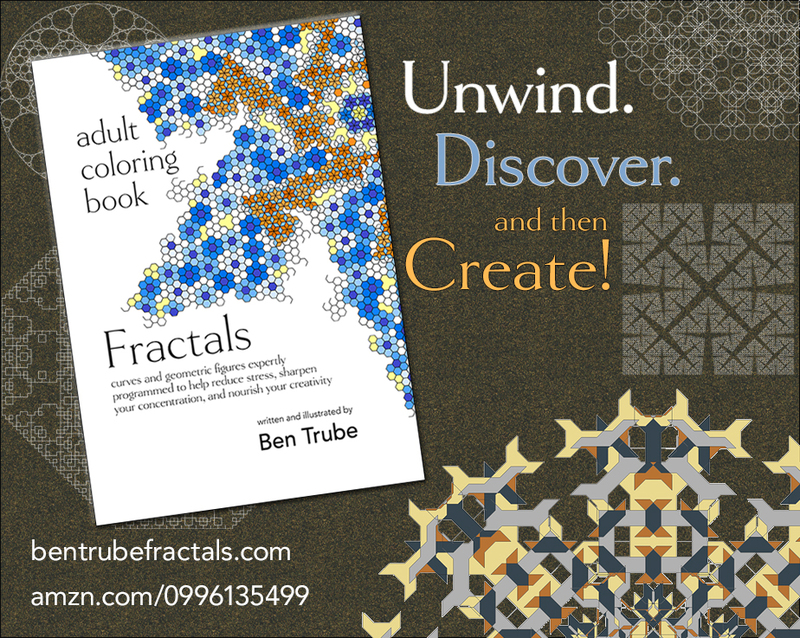 If you’re looking for a gateway to understanding fractals, particularly how to make them, it’s not a bad place to start, and it’s free on Kindle Unlimited. Kind of an old fractal classic, known colloquially as “Flowsnake” when it was written about by Martin Gardner, and also as the Peano-Gosper curve. 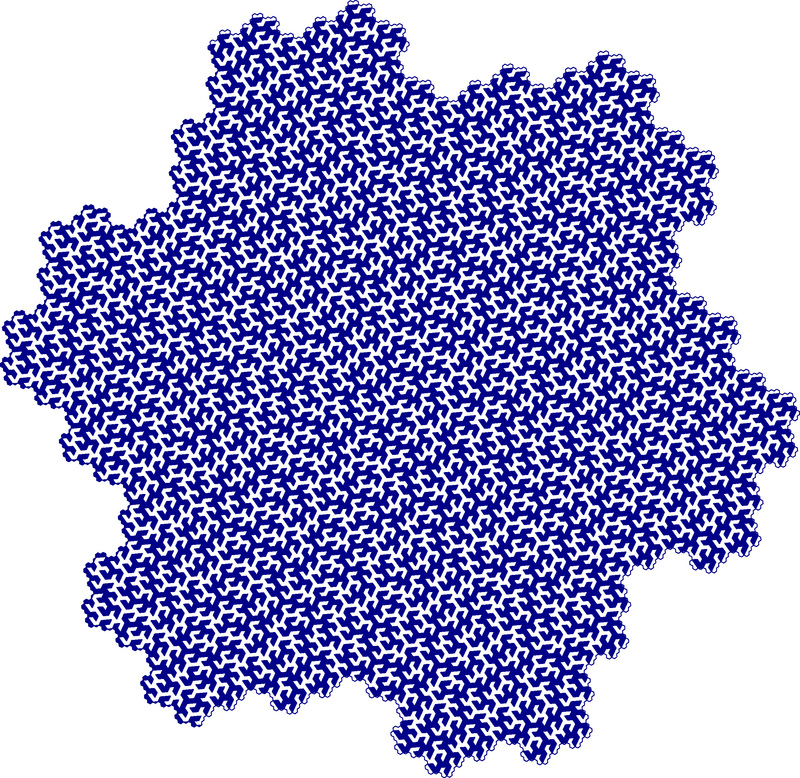 The gosper curve at the border bounds the inner fractal so we can get the nice blue dye effect. I did this with a single L-System so I can generate all different sizes of the two curves, while still keeping them inside each other. Enjoy! I produced some new animations for the Adult Coloring Book showing how three of the images are drawn line-by-line. Several of these are variations on classic fractals, while “Cog in the Machine” is my own original creation. Enjoy!